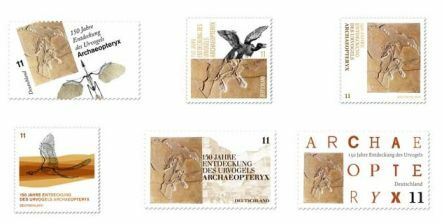 Germany 2011 "150 years of discovery prehistoric bird Archaeopteryx"
For several years now, stamp collectors have kept various stamps with prehistoric animals depicted on them in their collection and enjoy researching them. 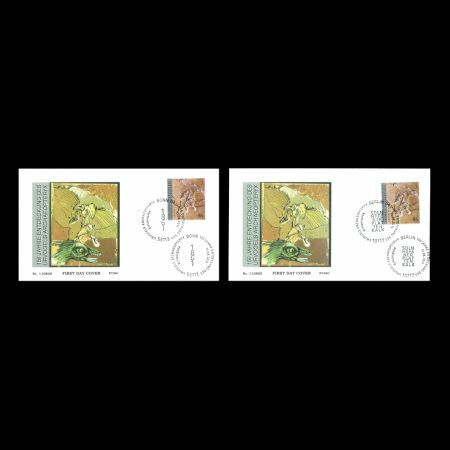 Most collectors utilize a PC or notebook to research and find new stamps or to gather more information about a stamp they have just added to their collection. With all of the information available today across the web it is wise to have a fast PC to quickly find what you need. While PC's have become more affordable they are still considered a high cost item. 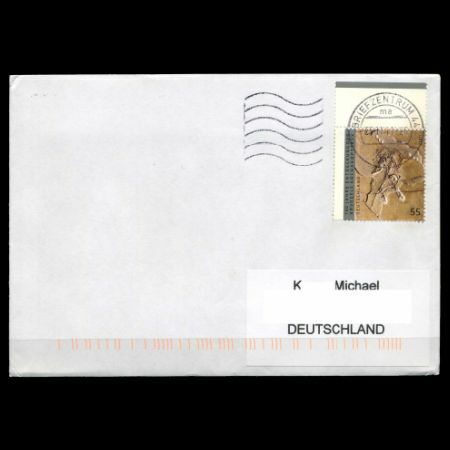 Many stamp collectors and PC users in general may visit a PC wholesale convention to find a new computer or parts to upgrade one they currently own. These conventions have many different computers and parts available at PC wholesale prices. 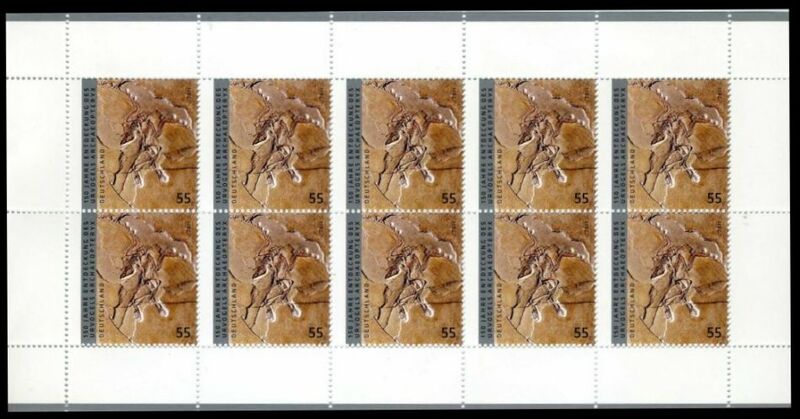 Doing research at a quick pace can be easily done with a new computer from a PC wholesale convention leaving stamp collectors more time to learn about the prehistoric animals that are featured on their stamps. 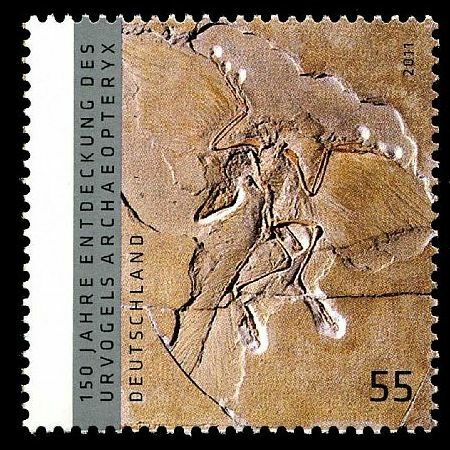 The prehistoric bird Archaeopteryx is one of the most famous fossil in the World. It was described in 1861 based on one feather cast. Later one when some completed speciments found it was very importnat evidence of Theory of Evolution. As intermediate specie from Dinosaurs to Birds Archaeopteryx has some bird and reptilie specific parts in his skeleton. Ancestor of Archaeopteryx was a small predator dinosaur. 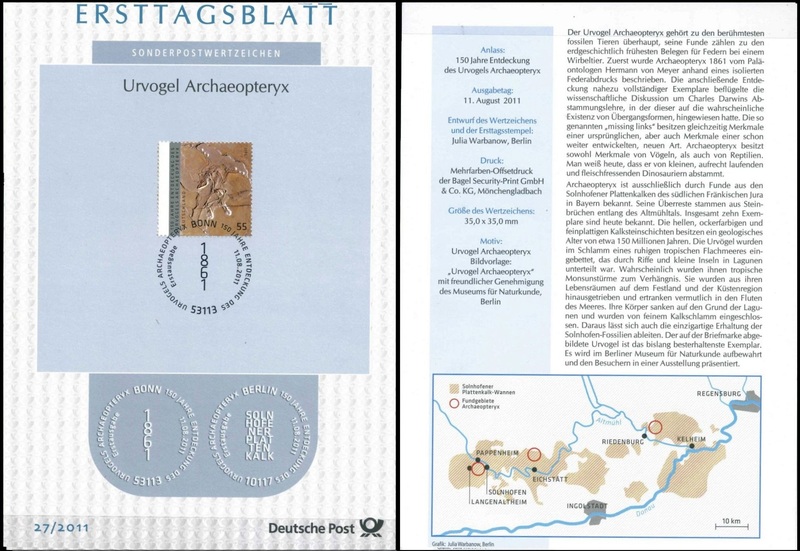 All fossils of Archaeopteryx are founded so far are comming from Solnhofener Plattenkalken at Fraenkischen Jura region of Bavaria state, in Germany. They are about 150 M. years old. The best fossil exemplar ist stored in Museum fuer Naturkunde in Berlin. The second prize has the 1861 feather, but none of them used the 1861 skeleton. 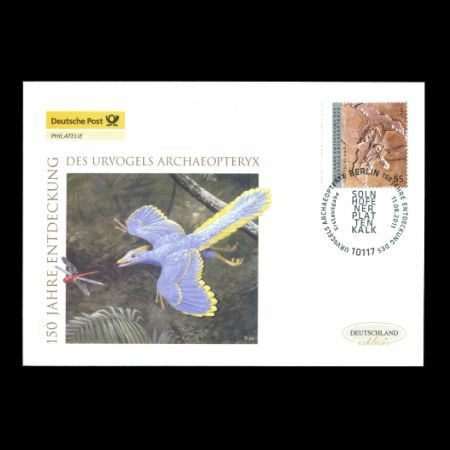 On August 11, 2011 Deutsche Post issued a single stamp to commemorate 150 years of discovery of Archaeopteryx (printed in Mini-Sheet of 10 stamps). 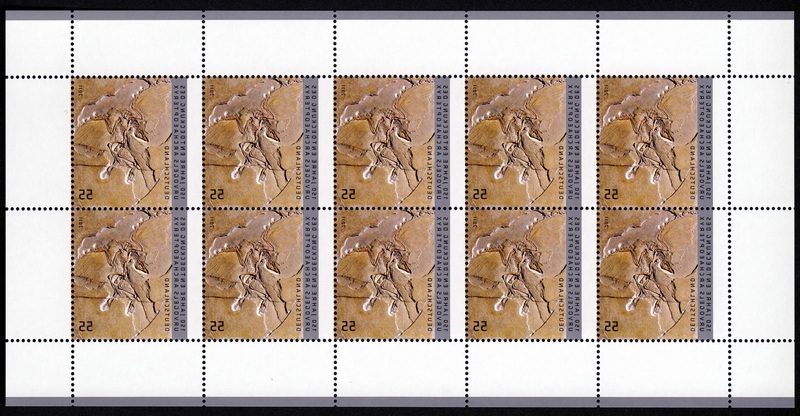 The best fossil exemplar, mostly known and appear on many pictures and illustartions of Paleontology related books, called "Berlin speciment" - depicted on the stamp, and stored at "Berliner Museum fuer Naturkunde". 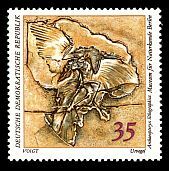 These fossil was already depicted on a stamp of GDR in 1973 as part of stamp set of 6 values, shows various fossils from the museum collection. The initial discovery, a single feather, was unearthed in 1860 or 1861 and described in 1861 by Christian Erich Hermann von Meyer. It is currently located at the Humboldt Museum fuer Naturkunde in Berlin. This is generally assigned to Archaeopteryx and was the initial holotype, but whether it actually is a feather of this species or another, as yet undiscovered, proto-bird is unknown. There are some indications it is indeed not from the same animal as most of the skeletons. The Berlin Specimen was discovered in 1874 or 1875 on the Blumenberg near Eichstaett, Germany, by farmer Jakob Niemeyer. He sold this precious fossil for the money to buy a cow in 1876, to inn-keeper Johann Doerr, who again sold it to Ernst Otto Haeberlein, the son of K. Haeberlein. Placed on sale between 1877 and 1881, with potential buyers including O.C. Marsh of Yale University's Peabody Museum, it was eventually bought by the Humboldt Museum fuer Naturkunde, where it is now displayed, for 20,000 Goldmark. 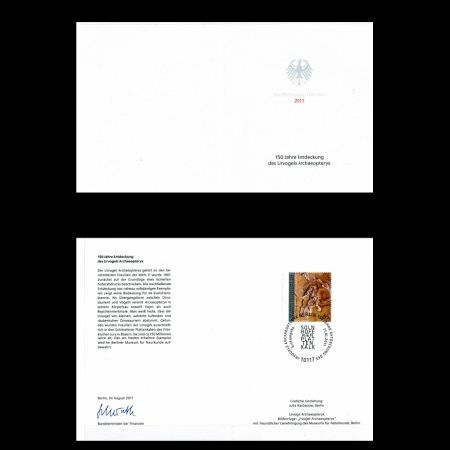 The transaction was financed by Ernst Werner von Siemens (depicted on several German stamps), founder of the famous company that bears his name. Described in 1884 by Wilhelm Dames, it is the most complete specimen, and the first with a complete head. 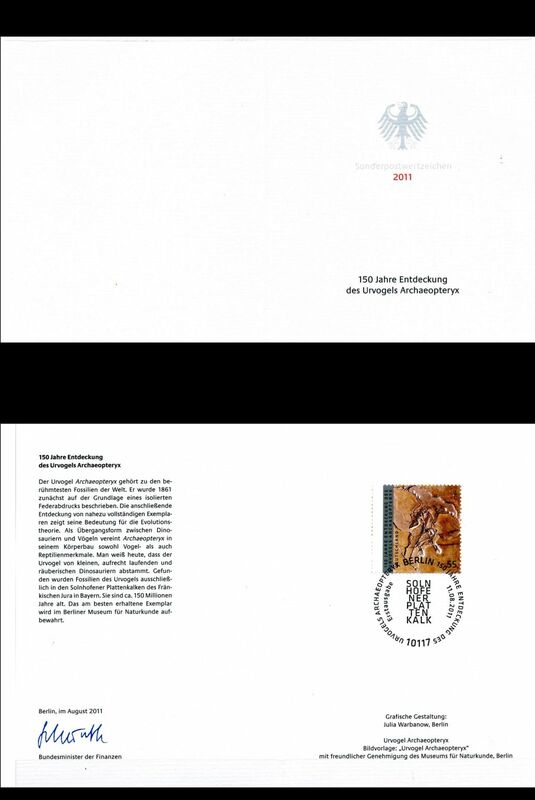 It was in 1897 named by Dames as a new species, Archaeopteryx siemensii; a recent evaluation supports the Archaeopteryx siemensii species identification. Nowadays, some paleontologist says Archeopterix is not the fisrt Bird, but the last flying lizard. 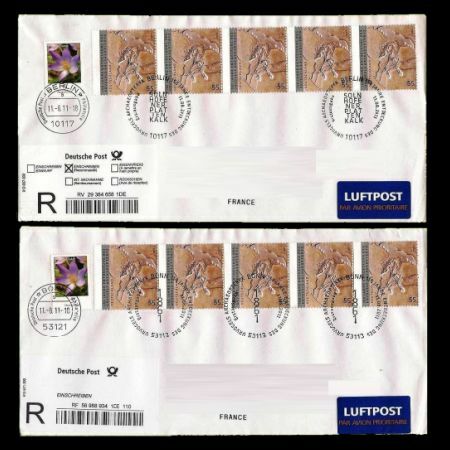 There are two postmarks issued with the stamp:postmark of Berlin used on official FDC of Deutsche Post, postmark of Bonn used on Souvenir Sheet Three additional postmarks issued by Deutsche for some other location that have some connection to Archaeopteryx: Solnhofen - the vilage where all Archaeopteryx fossils are found. 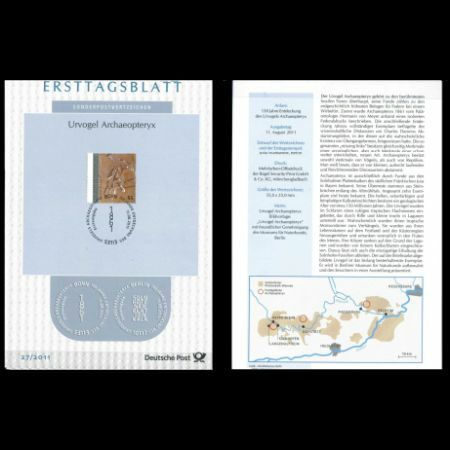 Eichstaett - small town near Solnhofen, has imoressive musuem of natural history with many fossils that found on the region, include Archaeopteryx. Dino Park Muenchenhagen at Rehburg-Loccum - the biggest park with life-size replicas of Dinosaurs and other prehistoric creatures in Germany.